We spend years to collect money to buy our favorite car, and when we buy the car, we are on cloud nine. But if any unfortunate incident happens and we lose that car which is recently bought, we are beyond despair. Such an incident happened to a woman in Wisconsin whose two years of saving went up in flames just after 20 minutes of expenditure on the purchase of the car. 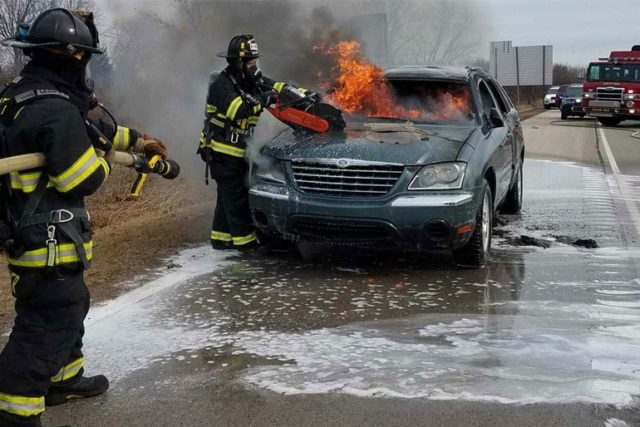 This news broke when a certain picture of burning car and fire department trying to put out that fire were shared on the social account of the respective fire department. As one can see in those pictures, it looks like that the car was bursting in flames by the time by the time law enforcement reach the location. According to the fire department of Wisconsin, Nicole Brandt saved for two years to buy a car for herself. After saving enough money, she bought the Pacifica from a locally used car seller Big Bills’ used cars. When she was driving it, smoke started coming out of it. Nicole describes that the smoke was coming from underneath the car as she felt something was melting. She desperately came out of it and called the emergency number. Till the fire department came, the car was already in flames. Nicole was beyond words as the purchase was made just half an hour earlier. She demanded that the car distributor must give her money back because it was their fault that their sold car could not spend 20 minutes on the road. According to the reports, the distributor has agreed to give them the money and have given her a check as well, but according to the bank, no amount has been transferred yet. Since she did not have any insurance of the car so that way is also not going to work for her as well. More to report, the fire department doesn’t know the cause of the fire eruption in the car, but they will not be looking into this matter. Poor Nicole lost her $29,000 in just 20 minutes or so after almost two years of saving.